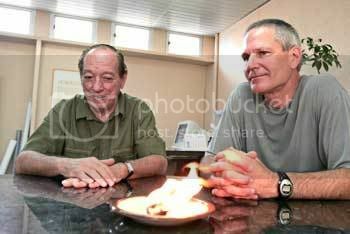 Tecbio's president Expedito Parente and Boeing's Danny Hatfield at Tecbio's headquarters in Fortaleza, Brazil - burning some biokerosene. Earlier we wrote about biofuels for aviation, reporting that Argentina's air force carried out the first tests with green fuels in a large aircraft (a C130). We also pointed out the many challenges facing the production of biofuels for airplanes. Now America's National Aeronautics and Space Administration (NASA) and Boeing are teaming up with Brazilian biofuel company Tecbio to develop biokerosene ("biojet"). The alternative vegetable-oils based fuel to power airplanes was invented by Tecbio in 1980 and flight tested in Brazil on the 24th of octobre 1984. Back then, the test was carried out with pure (B100) biokerosene which the company called 'Prosene', in a Bandeirante aircraft (manufactured by Brazil's Embraer, a company that developed a small ethanol powered airplane). The pilot successfully flew the craft for 600 kilometres from São José dos Campos -- Brazil's aircraft manufacturing hub -- to the capital Brasília (for this history, see Diário do Nordeste [*Portuguese and cache]). Soon afterwards, on low oil prices, the fuel was abandoned, only to attrach fresh interest again after oil prices rose to record levels this year. "We are starting to resurrect biokerosene ... the scenario today is different," Tecbio's president Expedito Parente said, adding that the partnership with NASA and Boeing was still at an early stage. A memorandum of understanding was signed earlier this month. Parente told the seminar in Sao Paulo that he expected to get the fuel patented in 2008. According to Francisco Nivardo Ximenes Guimarães, Tecbio's commercial spokesperson, the biokerosene will revolutionize agriculture in Brazil's poor Nordeste region [*Portuguese / cache] - promising to bring countless jobs to small farmers and the rural poor. "The new kerosene can be produced from vegetable oils from some ten different oil crops which thrive in this most underdeveloped region of the country." Oilseed bearing (exotic) palm species such as babaçu ('babassu', about which we reported earlier - see last note), macaúba, and coco-da-baía will be used, amongst others. "The north hosts some 18 million hectares of wild Babassu trees", he added. Brazil takes pride in its aviation history, claiming to be the native country of the 'real father of aviation', Mr Santos Dumont who flew airplanes earlier than the Wright Brothers. Even though that history is up for dispute, it looks certain that Brazil might rightly claim the accolade of being the first to fly commercial aircraft on green, clean, renewable biokerosene. United Nations Industrial Development Organisation (UNIDO): Shenzhen High-Tec Fair 2005, China, where Tecbio presented its award-winning presentation "Reflexions on Lipofuels: Biodiesel and Biokerosene" ('Blue Skye Award'). Tecbio, recent seminar: Dos Novos Biocombustíveis à TecBio - um breve histórico [*.pdf / Portuguese], with info on the biokerosene production history.